The Foreign Affairs Committee of the National Council of Resistance of Iran (NCRI) compiled a comprehensive report on the role of Iranian embassies in the regime’s network of terror, targetting particularly the MEK– Iran’s principal opposition organization. The study was one of the most detailed of its kind and exposed the nefarious workings of the Iranian regime’s terror machine. After the clerical regime’s seizure of power in 1979, it quickly became apparent that the regime lacked the political weight and pragmatism to meet the evolving needs of the Iranian public. Instead of divulging power to the public, implementing democratic reform, or even hearing the public’s grievances, the regime pursued repressive policies to force the population into submission. It did this in two ways. Firstly, it launched a vicious internal crackdown on opposition groups within Iran. The People’s Mujahedin Organisation of Iran (MEK) became a target as the largest opposition group in the country. This bloody internal crackdown would peak in 1988 when 30,000 members of the MEK were executed and murdered on the orders of the Supreme Leader. In conjunction with the bloody crackdown at home, the regime embarked on an ambitious campaign of terror abroad. The regime used terrorism as a method of statecraft, as one French official described, “the whole Iranian state apparatus is at the service of these operations”. 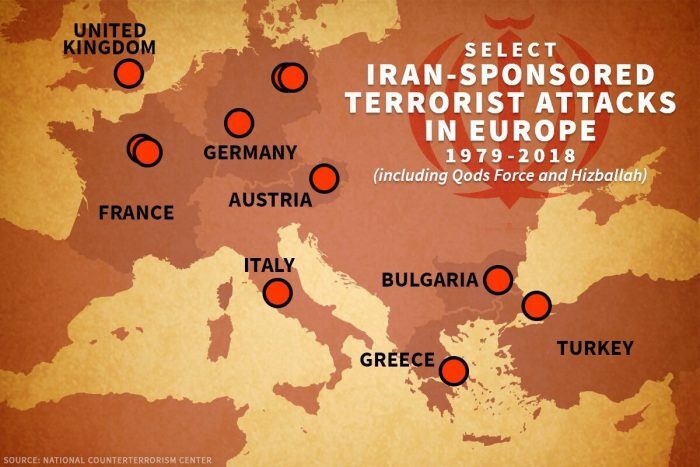 Recent foiled terror attacks, both in Paris and Albania, have revealed that the orders for Iran’s terror plots come from senior members of the regime leadership. The MEK and the NCRI revealed following the attempted bomb attack on the MEK’s Grand Gathering in Paris, that the regime’s terror plots are planned by the highest national security apparatus in the regime, the Supreme National Security Council. The National Security Council includes the head of the IRGC, Qods Forces, Ministry of Intelligence (MOIS), Foreign Ministry, and is headed by Hassan Rouhani and Khamenei himself. Following approval from the Supreme National Security Council, MOIS agents working in Iranian embassies around the world are involved in the planning stage of the terror attacks. In the case of the Paris attack, Assadollah Assadi, an Iranian diplomat working at the regime’s embassy in Vienna, was the mastermind behind planning the attack. He allegedly provided a Belgian-Iranian couple with the explosive material to be used in the attack along with instructions of how the attack would be executed. For decades, the regime has maintained terrorist sleeper cells in Europe ready to carry out attacks on the orders of the regime leadership. After 2008, the regime extended this terror network into Asia and Africa. The regime is now estimated to have active cells in Turkey, Georgia, India, Malaysia, Thailand, and Kenya. Although the regime has been expanding its terror network across the globe, nowhere has this been more apparent than in Europe. 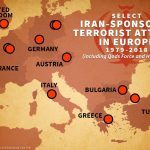 2018 has seen a surge in regime terror activity in Europe, the latest of which was the failed attempt to plant a bomb in Paris at the MEK’s annual Grand Gathering event. The NCRI’s report detailed that the regime’s Austrian embassy is the regime’s hub of terror operations in Europe. Before his arrest by German authorities, Assadollah Assadi had been stationed at the Austrian embassy since 2014. The Austrian press has long-suspected that the regime’s operations in Vienna went beyond normal diplomatic activity. In 2013, Die Presse, a prominent Austrian newspaper asserted that Austria was full of spies for the Islamic Republic. Findings from the research library of the US Congress supported this assertion. It calculated that Tehran employed around 100 spies in Austria, some of which are Iranian citizens and others Austrian. The Austrian embassy also has a history of involvement in terror activities. In 1989, three Kurds were killed in Vienna after they arrived at talks with regime officials. The Iranian embassy was found to have been involved in the planning and logistics of the assassination. The gunmen even arrived at the site where the assassination took place in a car registered to the Iranian embassy. More recently the Iranian regime has expanded its diplomatic activities in Albania. This is a thinly veiled attempt to scale up terror activities in the region. Albania began accepting refugees from the MEK following the massacre of its members in Iraq at the hands of regime agents in 2013. This was of significant strategic importance for the regime and its leadership. Prior to 2013, the Iranian embassy in Albania had never had more than a skeletal team of two or three diplomats. It has since grown into one of the largest Iranian embassies in Europe, as the regime uses the embassy as a logistical base to mount attacks on the MEK members living in exile in Albania. The former Albanian Prime Minister, Pandeli Majko, described the Iranian regime’s terror strategy in the region as “unprecedented”. In March 2018, the Iranian regime planned a terror attack on the MEK during the Persian New Year (Nowruz) celebrations. Two Iranian agents were later arrested on terrorism charges by Albanian authorities. The regime’s embassy in Paris has also been an active part of the regime’s terror machine in Europe. It began coordinating attacks against the Iranian resistance and the MEK in the 1980s, under the guidance of Iranian intelligence officer, Gholam Hossein. In 1991, the Shah’s Prime Minister and his assistant were assassinated by a three-man assassination squad in Paris. One of the assassins was Zeinalabdedin Sarhaddi, a diplomat based at the regime’s embassy in Switzerland. The NCRI reports that the regime’s Turkish embassy has played a central role in supporting the regime’s terror activities across Europe. Geographically, the nation bridges Iran with Europe, and the regime has used it to provide logistical support to its embassies on European soil. Most recently, in April 2017, the director of GEM TV, Said Karimian, was shot and killed in Istanbul. The influential TV executive was shot 27 times by regime agents. How Do You Solve a Problem Like State-Sponsored Terrorism? These recent incidents indicate a clearly-defined surge in terror activities in recent years. The MEK-led protest movement is gaining traction within Iran, and international sanctions designed to constrict the Iranian economy will only fuel the fires of discontent. During the December and January uprisings, anti-regime protests rapidly spread across Iran’s towns and cities, further demonstrating that the people are ready for regime change. These circumstances have left the regime’s future in power unclear. For the mullahs, terrorism represents a channel through which they can shore up their power. By targeting the MEK abroad, they hope to limit its power at home. This is why the regime has crafted an expansive network of terror across Europe. Using embassies as logistic hubs, the MOIS can orchestrate violent attacks on the MEK, many of which endanger the local European population as well as the MEK. The regime cannot be permitted to use its embassies as safehouses for terrorism in this way. In its report, the NCRI called on the European governments to close any Iranian embassies on their soil. Only by closing all diplomatic buildings can European heads of state guarantee their citizens are safe from Iran’s state-sponsored terrorism. The NCRI wrote, “the West should recognize that relations with the world’s leading state sponsor of terrorism are no more legitimate than relations with ISIL”. It’s report clearly demonstrates that simply having an Iranian embassy on your nation’s soil endangers the lives of your citizens. It is time this terrorist machine was brought to a halt. This can only occur with the closure of each and every regime embassy.